Paulin, the cargo bike of our association, has a new home since February! Paulin now lives in the shop Kevkus in the Berliner Allee 200-204 – just around the corner. Thus, it is now also for neighbors, bike enthusiasts and at all who want to abandon the car, regularly available for free. 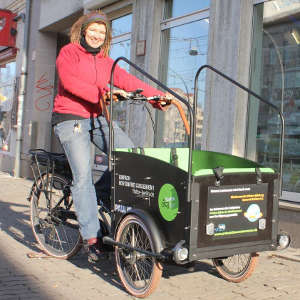 The rental is organized through the rental system fLotte, an initiative of the ADFC Berlin, which since March 2018 enables the free hire of almost 40 cargo bikes in various districts. A godfather who takes care of the bike and the owner of Kevkus make this possible through their volunteer commitment to the project. With Paulin, larger purchases and transports can now be done easily in Weißensee without a car. Because the three-wheeled Bakfiets Troy has an electric drive and a box that can be loaded with about 100kg and offers space for four toddlers. In bad weather, a rain cover can be pulled over. Small conversions by volunteers of our association also make Paulin even more practical. The cargo-bike rental is the result of a workshop day of the Prima Klima project in Weissensee, in which the active members of our association took part and together made plans for the traffic turnaround in our district. The loan is possible every Monday, Tuesday and Thursday between 11:00 and 16:00. A reservation must first be made via the website flotte-berlin.de. On the remaining days of the week, the bike will continue to be available for our associations activities as well as for the users of our seminar and guesthouse tagungswerk, so that they too can do their shopping in an environmentally friendly and secure manner. Hot water is a substantial part of the building services and a significant energy consumer. When using hot water in the kitchen and the baths of the tagungswerk guest house not only water through the direct consumption of groundwater (Berliner tap water) is consumed but also a significant amount is spent on energy. This takes place in the tagungswerk as throughout the whole KuBiZ project primarily through the use of gas. But electricity is used as well – mainly for pumps that get run on the water circuits. In order to circulate the hot 60° hot water in the house, we use a relatively small so-called “high-efficiency pump” from the best energy efficiency class (A). Even with the use of gas and electricity we create a (indirect) water footprint. To make the hot water throughout the house as efficient and environmentally friendly as possible, we decided during the reconstruction and renovation of the building to separate the heating and hot water supply. This allows in the summer months, to turn the large boiler (400 litre boiler capacity) completely off and to produce hot water only with a small gas heater. Here we save a lot energy by reducing the amount of process heat. In addition, we have installed a solar heating system with a size of 36.5 m² collector area on the south roof. Using this system, we can make solar energy for water heating available. Last year we were able to use about 8.7 MWh solar energy. On sunny days in spring and summer, we cover most of the energy required for hot water supply from solar energy. Nevertheless, our share of the water footprint of hot water usage is not small. In our overall water-footprint calculation of tagungswerk we used an estimate because an accurate calculation would have exceeded our capacity. The positive effects of the solar thermal system were taken into account. In the context of the project “Water and Sustainability” and in order to use the best practice example of our solar hot water production in education and make it visible for our guests we installed an extension of the control electronics which now also allows to make the current values ​​and the facility-scheme in Internet (on the website of tagungswerk and KuBiZ) visible. In addition a digital display board which provides information on the solar thermal yield at the main entrance, which is being renovated yet, will be installed after the work is finished. The preparations for this have already been taken from us. At the beginning of the project, we found ourselves in the very difficult situation, that we could not find a ready-made water-footprint calculation-tool, that could be used for our organisation. The association Förderverein Offene Bildung Umwelt Kultur itself carries out a variety of different cultural and educational activities. But most of them are singular activities and a lot is supported by voluntary work and is implemented at different places. This led us to the conclusion, that it would be impossible to figure out the water-footprint for all this different activities. So we focused on one activity-field of the association: the running of the tagungswerk guest-house in the educational and cultural Centre KuBiZ in Berlin-Weißensee. We did that as well, because we think, that this facility has the by far biggest water-footprint of our associations activities and that the evaluation and improvement here would have the biggest total result. The guest-house is 286 m² big, offers beds for a maximum of 27 people and has two conference rooms suitable for 25 to 30 persons each. The facility offers it’s visitors seven showers, six toilets, a kitchen with dishwasher and a washing machine. The cleaning-process is mostly organized by our staff, but the meals are prepared by the visitors-groups themselves, which are mostly not of our organisations but renting the facilities for short term. Consequently, we could not include the food-production as well as the use of paper and other materials by the other groups in the water-footprint of the guest-house. We could only calculate the water-footprint of the guest-house related to the factors that we can control and change. Our first attempt to do so, was to use the excel-sheet, which was developed from our partner-organisation Antartide. We got a total water-footprint of 661 m³ out of which 446 m³ was the direct water consumption allocated by the meters in the facility. But we realized that the use of this calculator might be problematic for us: The calculation is very simplified and mainly includes food, direct water consumption, energy-usage and industrial goods. But in our case we are in some points out of the mainstream: 1. We already use a lot of renewable energy and we tried to make best choices here. 2. We are using a lot of cotton and we have to wash and clean a lot in the guest-house. 3. We have a high demand of energy e.g. for hot-water in the showers etc. 4. The most of the food-consumption is not allocable for us. So we started to enhance the water-footprint calculation for the special need of our guest-house operation and finally got out a total water-footprint of 835m³. The first step evolved out of a simple need: we had to replace a lot of our bedding wares, because they were depleted. During the partnership-project we already carried out, that the agricultural production is one of the most important factors in global water-crisis and that cotton-production is sometimes very problematic. We noticed, that most of our bedding-wares are made of cotton and that we have to think about this in order to make sustainable decisions in the purchasing-process of new bedding-products. So we started a deeper research about our options and the water-footprint of the different products, that we could afford. We understood, that our choice would have a big influence on the water-footprint of our guest house. 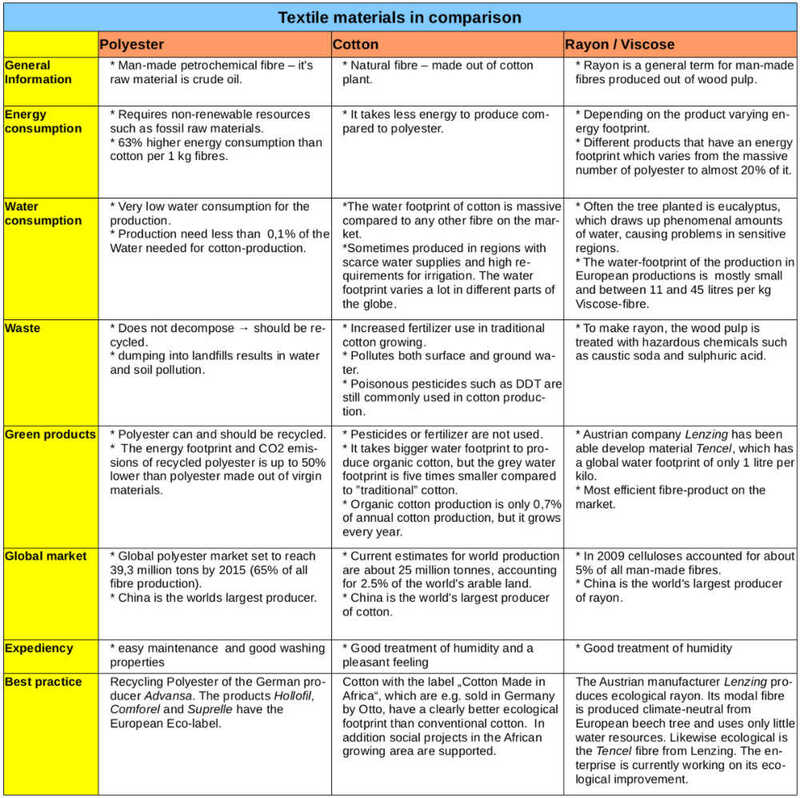 So we compared the different materials, products and producers and we made a deeper research on Life Cycle Assessments (LCA) and water-footprints of the different products. In order to not only focus on the water-issue, we included the energy-usage during the production-process as well: CO2-emissions are strongly affecting the global warming process, which is additionally leading to water-problems. Beside that, we had to take in account the quality and suitability of the materials and it’s prices. In the best-practice-chapter of this handbook, we describe this process and justify our decisions. Finally we had a water-footprint of around 130m³ for around 40kg of new bedding-wares. This means an average of 3,25m³ water per kg of bedding-wares. But this number has to be interpreted. 102,2 m³ of the water-footprint is caused by the fibre “Cotton Made in Africa” which accounts for 7,2 kg of the whole material. Only 12,4 m³ are caused from conventional Cotton and 8,4 m³ from organic cotton (GOTS) with a material use of only 0,6 kg. The far biggest amount of material is 22,5 kg of the Tencel® fibre, which assigns with only 5,8 m³ water use. Only polyester has a better water-footprint. But it is worth focusing on the details here: Cotton made in Africa (CmiA) is a label and an initiative of the “Aid by trade foundation” which was founded by Michael Otto, the head of the Otto group, the world’s largest mail-order company. Our conclusion is, that this kind of cotton-production is very much more sustainable than the conventional cotton production and should be supported. Conventional cotton on the other side has a blue-water-footprint of around 5,4 m³ per kg and a grey-water footprint of 1,8m³ per kg. As this numbers show, this cotton is mostly produced with intensive farming methods and a high use of fertilizers and pesticides. We could see this negative examples during our partner-meeting in turkey as well. If the cotton comes from China, Pakistan, India and even the USA, it causes big problems there, because of serious water-scarcity in this regions. The CmiA-initiative on the other hand is providing social, agricultural and economical support for the communities and the farmers with whom they work. Besides, we decided to use mainly products that combine CmiA with the Tencel Fibre. Tencel has a lot of ecological advantaged and is very environmental-friendly compared with Cotton. Furthermore, it offers almost perfect moisture-treatment and a long durability. Organic cotton (certified e.g. with the “GOTS”-label) can be an alternative to conventional cotton as well. The grey water footprint of organic cotton is much smaller than the one of conventional cotton and even 30% smaller than the already small footprint of CmiA cotton. But organic cotton still has a huge blue-water footprint. The biggest problem is, that there are no rules in the GOTS or other organic-label restrictions concerning the usage of water. On the other hand it is mostly impossible to get information about the exact origin of the fibre. Finally, it cannot be proved, whether the organic-cotton was produced sustainable regarding water-issues. A huge number of the organic cotton production takes place in Pakistan in areas with high water scarcity and with a very high demand of water. Finally in our organic cotton water-footprint of only one pillow and one duvet – with together 2% of the total fibre we bought – accounted for 40% of the overall water-footprint of the total 40 pillows and duvets. Concerning other bedding-wares and textiles used (like towels etc. ), we did not make any major purchases in 2014. So we calculated the deterioration of our used products and took this in account. All this products are made of conventional cotton at this point. We will try to improve this in 2015. For the calculation of conventional cotton, we refer to a water-footprint of 13,1 m³ per kg of cotton. In the future we will try to use more Viscose/Tencel or linen products. When we will use Cotton, we will try to use more CmiA-cotton-products. The second big factor in the simplified calculation was the use of energy. As we said before, our electricity supplier is the Greenpeace Energy company. Greenpeace Energy’s electricity production is 91% from water-power plants and 9% from wind-energy. The hydro-power plants usually in the water-footprint-calculation have a high water-footprint, as it is mainly coming from big hydropower dams. But Greenpeace Energy only sells energy produced in flow-hydropower plants, that have a very much lower water-footprint. The average is 22 m³/GJ**. We calculated with a water-footprint of 1 m³/GJ, which is a high average number for the flow-power plants evaluated in the calculation on water-footprint.org. 9% of the electricity, that Greenpeace Energy sells, comes from wind-energy, that has almost no water-footprint. By the way, there is as well a photovoltaic power plant on the roof of KuBiZ that is producing solar-electricity. But the plant is connected and sold to the public grid. Much more energy was spent for heating and hot water production. The heating system of KuBiZ is based on natural gas and solar energy. It is difficult to get exact data, which water-footprint this energy-consumption has. Following the studies on water-footprint.org, we took the water-footprint of 0,11 m³/GJ in account. The number might be too high, because in the case of electricity a big amount of power gets lost in the grit, what is not happening in a local heating-system like ours. The efficiency of modern condensing gas boilers is very high and it has a very little loss of energy. But we were calculating with the higher numbers, because there is as well a loss of energy inside the building delivering the hot water and heating energy to our guest-house. Heating the rooms accounted for around 17 m³ and hot water-production with only 1m³ (approx. 1/3 was produced by a solar thermal system). Finally, we as well the accounted the energy use of our internet-facilities. The partner Antartide did a research about it and we adapted it to our situation. We got to 2,1 m3 for the use of the guest-web-access and 1 m3 for our websites and email-accounts. Paper production has a big water-footprint in the world. We used 20 kg of printing paper and 65 kg of toilet paper. 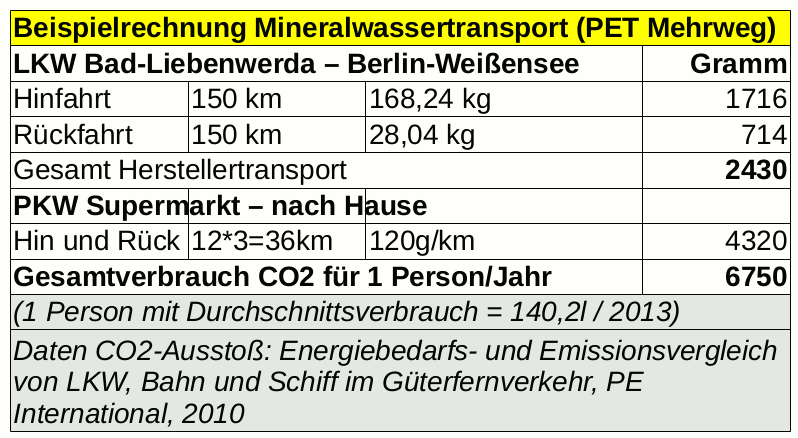 But because only 1,25kg have been non-recycling-paper, the water-footprint was only 2,5 m³. There is not much improvement possible, because the biggest amount of this is recycling-toilet-paper. The direct water-footprint of our guest-house contains the water consumption in the office and in the guest-house facilities. The office-consumption is only 6,7 m³ cold-water while the guest-house consumes together 440 m³ of cold and hot water. During the research we controlled the facilities, whether they are equipped with water-saving installations. All toilets had water-saving toilet flushes as well as all showers were equipped with water-saving shower heads. The sinks had single-lever mixer taps. The modern equipment of the guest-house offered already very good water-saving conditions. So the only thing that we made was to reduce the flow of the tabs by closing the valve under the sink to the optimum. While working on this water-footprint for our organisation, we had to face a lot of difficulties, but finally reached our aim at least partially. At some points, a deeper research would be needed and there are a lot of consumer products of which we could not find detailed data. But in major fields, like the analysis of our textiles use and purchases, we got a punchy result, that provided us with guidelines for our further all day practice with textiles. Our next step will be to evaluate textiles made of Tencel. Especially the missing segmentation between the green, blue and grey water-footprint in this evaluations offers perspectives for development. Furthermore, there is a need to put the calculated virtual water-footprint in relation to the water-stress (or water scarcity) that it may produce in the country of origin. This would allow us to set priorities for the development of our indirect water-consumption. We were surprised, that more than half of the water-footprint of the guest-house is coming from the direct water usage. But this result is obvious, because we did not take the food in account. This could be a next – but very difficult – step in the water-footprint assignment. As a first step on this way, we did an evaluation of the 9-day long European Erasmus+ Workshop that had been carried out in March 2015. The results are published on the projects website. The Dishwasher is our second important cleaning tool in the guest-house. All groups use the dishwasher to clean their dishes. The dishwasher has high load factor. There are several Tests of dishwasher detergents. Main difference is if the tabs contain Phosphate or not. There are several phosphate-Free products on the market. They are sold by discounters or in the ecostores. We made a selection of tested products from discounters and ecostores with their results and prices. We only used Phosphate-free products, because of their water-sensitiveness. In Germany phosphates are only banned in washing-detergents but not in dishwasher-detergents. ORO OPM Grün 0,10€/tab eco-friendly, but partly poor cleaning test “good” (2.4)*, second best Second best choice. Denkmit nature 0,11€/tab eco-friendly, medium cleaning capabilities and additional salt-use needed test “sufficient” (4.1)* Poor cleaning results. Ecover tabs 0,22€/tab eco-friendly but very poor cleaning test “sufficient” (4.2)*, poor product the best of the ecostore-products, but still poor. Is salt the problem? # Test was made from a commercial testing-journal. After a long research we decided to buy a dishwasher from the Company BEKO. We choose the product “BEKO DFN 6632″. It is certified Energy-Class A+ with a consumption of 0,94kW/h energy and 10l water in the standard-program (“ECO”). The next best A++-Product would safe only 0,02kWh with same water-consumption but a much higher price. A nearly similar Model was tested “good” from Stiftung Warentest. The newest Model with Stiftung Warentest “good”-rating is “BEKO DSN 6832 FX30″. It safes another 0,12kWh per washing-service while water-consumption is the same. “Intensive”: 28 Minutes faster, 6 l more Water, 0,32kWh more energy. In practical tests with the machine we made the conclusion that the use of the program has to be adjusted to the group-size and it’s needs. Large groups (more then 10 people): In daytime during the meals should use the program “Quick and clean”, otherwise they get a storage-problem with dirty plates. For overnight-service they can use as well “Eco” (with mainly glasses and cups) or “Intensive” (if the plates are dirty and a lot of them. Small groups (up to 10 people): Should use the eco-program normally if the plates are not to dirty. Quick and clean is the best choice if they have less time between the dishes and need the plates and intensive if they turn on the dishwasher with hard and/or sticky food on the plates. Install a sign for the users! Caution: We have a solar-thermal-water-system, that is providing 60° hot water through the warm-water-pipes. In case of strong sunshine this water will be delivered from solar-energy and with almost no energy-consumption. In this case the “Quick an Clean” program is a very good alternative, because it consumes nearly the same water, is much faster and the energy-consumption will not be almost the same because of the 60° water provided from the tubes. The “Intensive”-program should only be used if the dishes a very dirty and the machine is very full and/or the dishes stand for a long period in the dishwasher. Since the opening of our seminar house we face the problem that many guest groups want to drink mineral water with carbonic acid. Most of the groups arrive without cars and so they can not transport many drinks crates to the seminar house. In addition, there are only few storage capacities and there is no elevator to transport the drinks conviniently. Often many bottles are left after the departure of the group, which we have to bring to the supermarkets or dispose. In our water partnership we came to know that the Berlin tab water has an excellent drinking water quality and there is no reason not to drink it, the more so as it is directly and conviniently available for a good price. Yet it is not carbonated. Special expensive water bottles are needed for the carbonation. It is difficult to guarantee the bottles are hygienically. The price for the CO 2 -cylinder is relatively high with 7-8€ per piece. All available low-priced home carbonation systems are offered by the Isreali enterprise „Sodastream“ that is controlles the market with over 70% of the produced home carbonation systems. The company is in the focus of critics because they are producing in the occupied Palestinian territories (in the settlement Ma’ale Adumim)*. Our research revealed that for the public use of carbonation systems professional providers mostly rent their gadgets and close a contract for maintenance, amounting 80-100 € per month. In addition they offer complex buying systemswhich often cost more than 1.000 €. In our research we found the very interesting system of the south-german company Aquatechnik Peter Röhl und Partner. On the website of the company two simple, genious and reasonably priced carbonation system are offered. The system works both with the home carbonation CO 2-cylinders and the much cheaper CO 2 returnable bottles. For the system common PET mineral water bottles are used. The system is very hygienic because the water is not in contact with the gadget. The special caps for the bottles can be cleaned in the dishwasher and can be replaced cheaply. A simple system, here in the version for using a big CO2-bottle. The water bottle is a standard PET returnable bottle. (1 or 1,5 liter). The system costs 379 € (2014) in the standard version (with connection to the small CO2-cylinders from the supermarket) and 479€ in the version with connection to the big gas bottle. The ecological costs of mineral water transport depend on comsumer ́s behaviour. Both the choice of the place of production and the type of the bottle are important. Those who buy water of the benchmark „Spreequell“ or „Bad Liebenwerda“, get the water from the 150 km apart south Brandenburg (Bad Liebenwerda). The bottle boxes are transported by trucks. The average consumption of mineral water per person in Germany was 140,2 litres in the year 2013. Returnable bottles are the most ecological way of package as a study of the national environmental office shows. It saves more than 50% of the material and 40% of the greenhouse-gas CO2 in comparison to the one-way bottle. According to a study** of the company Gerolsteiner the water consumption in the production of PET returnable bottles is only 1/3 of the water consumption of glass returnable bottles. 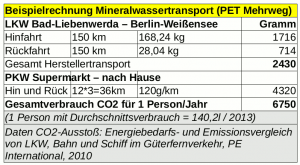 Per consumer of Bad Liebenwerdaer mineral water in Berlin 2,43 kg CO2-emission are caused by the transport of the water to the supermarket. When the water is transported from the supermarket to the households, the whole transport is nearly tripled. 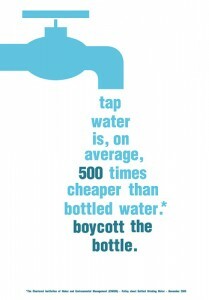 When water is bought in glass bottles, the CO2 emission from the transport to the supermarket are doubled. And if you buy for example „St. Leonhards Wasser“ from Chiemgau, which is offered in Organic-markets, it extends the transport way and the emissions again by the factor 4,5. Thereby the overall emissions of the transports are 9 times higher as with the Spreequell-water. The researches in the context of the transnational educational partnership-project have shown that the global agriculture is contributing with a substantial part to the over exploitation and pollution of the drinking water world-wide. A major part has the cotton-production, which additionally is mainly produced in areas with a shortage of drinking water. The usage of animal products, such as down represents likewise a huge problem for us: On the one hand because the production of animal products has a major part of the encumbrance of water, on the other hand, the problems of animal husbandry are inextricable and we would like to support the idea of not using animal products. The most spread alternatives on the market are products made from polyester (synthetic substance). But also this carries a number of problems with itself: First of all, these products are based on the resource oil/ petroleum. Additionally, the production process needs a lot of energy, uses a remarkably big amount of water and produces a lot of co2. Furthermore, polyester is not an ideal product as a bed cover for its characteristics with respect to the transportation of moisture. Some producers already changed their production by using recycled polyester (made from used plastic bottles) which is improving the impact on the environment at least. Fibers of Viscose represent an interesting alternative product. Viscose has very good characteristics with respect to the transportation of moisture and therefore is very suitable for bed covers. Additionally, there are modern ways of production, already in use on a large industrial scale in Austria. They have a positive environmental usage of water and energy could be reduced on a minimal level. The fibers are sold under the label “Tencel” and are increasingly used for beds. A current “life-circle study” has shown, that these Austrian tencel-products are very environmental friendly and even show positive effects on the climate. Also, the usage of water is reduced to a minimum. Therefore we classify this product as the best choice for bed covers and pillows. At this point, the product is mainly sold in combination with cotton. Consequently, we compared the different kinds of production of cotton and their influences on the usage of water as well as the ecosystems in the producing countries. The small rural production of cotton, especially following ecological standards, shows the best environmental and water balance. But also conventional small farms normally use little pesticides and do not water the plants artificial, but with rainwater. During our researches, we discovered the project “Cotton made in Africa” of the “Aid by Trade-Foundation”, which was set up by the “Deutsche Gesellschaft fuer technische Zusammenarbeit” (GIZ) (German Society for Technical Cooperation) in cooperation with numerous companies of the textile industry. Cotton made in Africa guarantees small-scale-farming in African countries. More than 270.000 farmers participate in this project and are profiting additionally of the social as well as educational projects and the minimum standards of the initiative. However, the standards of fair trade or of controlled ecological cultivation are not fulfilled. But also ecologically produced cotton neither guarantees small-farming, nor does it meets the standards of fair trade criteria, but the observance of ecological cultivation is the focus. Badenia “Irisette Tencel”The final production of the bed cover and the pillow of these products takes place in Germany. *The product “Catona” of the ecological mail order house “allnatura” used ecological cotton from fair trade, the price is noticeably over the sighted price of a maximum of 100 Euro. Furthermore 100 % cotton is used, which we do not consider to be the best mix of materials, as also ecologically produced cotton is often an encumbrance for the water resources. Additionally, the artificial watering following Eco-criteria (kbA) does not demand any standards. Beyond all that, allnatura does not identify the origin of the cotton. **The table does not claim to be scientific of “objective”, but summarizes the intermediate results of our Partnership. It is not a (scientific) evaluation of products as other big foundations and institutions carry out. The table shows the direct waterconsumption of tagungswerk guesthouse as well as the waterfootprint of our energy-consumption comparing the last three years. Our office, that we use with another association togethr, is not part of the evaluation. This will follow later.